Situated in the heart of one of Canada's most iconic cottage regions, Bracebridge is home to over 16,000 permanent residents who enjoy living in a vibrant community with pristine lakes, rivers, and forests providing a beautiful backdrop. The community combines Muskoka's cultural heritage and natural beauty with innovation and opportunity for business investment and growth. 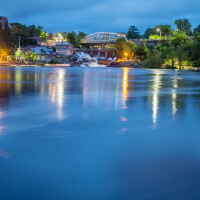 In addition to a thriving tourism industry, Bracebridge also offers a diverse economy with strong construction, niche manufacturing, green technology and professional services sectors. This strong business foundation is predicated on an extensive transportation network that includes easy access to major highways in addition to bus, rail, and air access. Abundant power, a high capacity telecommunications network, an affordable and skilled labour force, and available lands make Bracebridge a worthy candidate for starting or relocating a business. Maybe it's time to See Your Future from THE BRIDGE!